Green-Cheeked Conure Personality, Food & Care – Pet Birds by Lafeber Co.
Green-cheeked conures can be outgoing and comical, but they can also be a little shyer than other conures. These birds love their play and will appreciate a good rotation of toys and a spacious cage to run around. The Green-cheeked conure is a favorite among bird novices because of its relatively low price, small stature, temperament, and relatively low noise level, at least compared to its larger cousins. The green-cheeked conure breeds fairly easily and as a result is readily available. The Green-cheeked conure is one of the smallest conures and is often confused with the maroon-bellied conure (Pyrrhura frontalis), a close relative. These birds are so similar in appearance that they are often identified incorrectly by pet stores or even their owners. They are the same size, about 10 inches long, and both are primarily green. The green-cheeked conure is a bit brighter in color than the maroon-bellied conure and has gray barring on its chest, fading into a slightly reddish belly. The maroon belly has a golden barring on its chest and distinct, heart-shaped maroon shading on its belly — hence the name. Both have a dark gray beak and feet. They are most easily confused when they are young, before their full color comes in after the first molt. The green-cheeked conure is found in wild in Brazil, Bolivia, Argentina and Paraguay, where it inhabits forests and woodland areas. The novice and the experienced bird owner alike will enjoy the green-cheeked conure as a pet. This bird may not be for the very beginner, though someone who has experience properly caring for a parakeet or other small bird may be ready for this easy-going bird. Green cheeks are not known to be nippy, and are particularly affectionate. Because green-cheeked conures are highly affectionate and love their owners intensely, they need an owner that is able to give them a great deal of time out of the cage. With some attention on a daily basis, even paired green cheeks will maintain their pet quality. 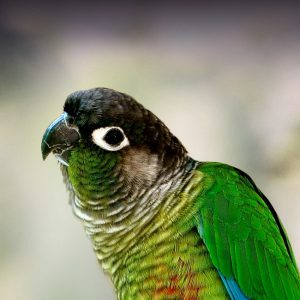 If you don’t have another green cheek, you can pair this bird with a maroon-bellied conure, but don’t allow them to breed. The green-cheeked conure will generally live peacefully with conures of similar size, though will not readily tolerate smaller birds, and might be in danger from the aggression of a larger bird. A green-cheeked conure should be offered a nutritionally balanced manufactured diet, supplemented with fresh vegetables, fruit and healthy table foods. Conures have busy beaks, which makes Lafeber foods a conure favorite. Lafeber’s Avi-Cakes, Pellet-Berries and Nutri-Berries offer balanced nutrition that appeals to a conure’s chewing needs. A green-cheeked conure can live up to 25 years or more with proper care. The green-cheeked conure is a little clown, always full of antics. These birds love to hang upside-down and clamor along the cage bars, waiting for their owners to play with them. Green cheeks are mischief-makers, so keep an eye on your bird at all times. This is a good bird for children, as it is small enough for little hands to handle and is generally good-natured. However, realize that any bird can bite, and little fingers are tender. Always use caution around birds and children, especially for the bird’s sake. Owners love the green cheek for its relative quietness compared to other conures. It is not as loud or as frequent in its calling, but it will make some noise. Green-cheeked conures have been known to talk, and some are able to learn quite a few words, but they are generally not prized for their talking abilities. Conures, including green-cheeked conures can be prone to feather picking. If a complete medical exam rules out medical causes of feather plucking, boredom and/or lack of appropriate mental stimulation can be a cause. Offer your green-cheeked conure an enriched environment with plenty of opportunities for play and foraging, as well as a staple supply of safe items to chew. Conures are also susceptible to Proventricular Dilatation Disease (PDD), Psittacine Beak and Feather Disease, Psittacosis, beak malocclusion and Aspergillosis. Regular health checkups by an avian veterinarian are crucial to your conure’s health, as they can help diagnose and treat many disease processes early on. Green-cheeked conures are one of the most commonly available conure species available as a pet. They can be found in large pet stores, as well as from avian specialty stores and through bird breeders. They are also often available for adoption from avian rescue and adoption organizations. A hand-raised, people-socialized green-cheeked conure can make an excellent family pet.